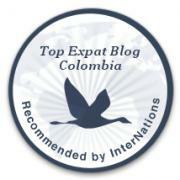 Update May 2018: Many thanks to Chris for writing to me to let me know that you can now extend your Colombian tourist visa online! Here’s his helpful blog post on this topic on The Unconventional Route. Many foreigners come to Colombia and find themselves wanting to stay .. much like myself 🙂 Thus arises the question of how to renew your Colombian tourist visa! EU citizens receive a 90-day tourist visa stamp in their passport upon arrival in Colombia; if you want to stay beyond these 90 days, it used to be necessary to leave the country and re-enter in order to receive a new 90-day visa stamp. However, many thanks to one of my blog-readers for contacting me and letting me know that this process has now been made a lot easier! Just go along to Edificio Platinum (Migración) in Calle 100 in order to apply to extend your visa for another 90 days. I’ve been told that this costs around 75,000 pesos. Make sure you bring your passport, a photocopy of your passport photo page and the page which has your first entry stamp, and two passport sized photographs. You can only pay by card in the building, otherwise you will have to go down Calle 100 towards Carrera 7 to Banco Occidental and pay cash there. After spending 180 days in Colombia in any calendar year, you must leave, or apply for a work visa (usually through teaching English) or a partner visa, if you are in a relationship with a Colombian citizen. Click on this link for information about how to get a Colombian partner visa. If you need any documents translated for visa purposes (they offer numerous different languages) I recommend Traducciones Bogota. I used them once and they had the official translation delivered to me in 2 working days. They also have English-speaking staff so you can write to them in English. This process has now changed,you don’t need to leave the country after 90 days, you can go to Edificio Platinum in Calle 100 and apply for an extension for another 90 days. It used to cost around around 75,000 pesos. Make sure you have a copy of your passport, your entry stamp and two passport sized photographs. You can only pay by card in the building otherwise you will have to go down Calle 100 towaRDS La Septima to Banco Occidental and pay cash there. Thanks a lot for this information Steve; I will update the post! Thanks a million, this information has been so useful.